Methamphetamine use is growing across Florida, and that trend is reflected in St. Johns County where the number of meth busts has increased for the past few years. St. Johns County’s first meth bust came in the 1970s, and meth labs weren’t discovered regularly again until the early 2000s, according to previous stories. Deputies started finding a few meth labs a year in 2008, said St. Johns County Sheriff’s Cpl. Mike Hartsell. In 2011 and 2012, the Sheriff’s Office found more than three dozen meth labs. “It’s not gonna slow down,” Hartsell said. Meth labs have been found across the county in hotel rooms, homes, backpacks and cars. Many of them are clustered in and around the city limits, but labs have also been found in Hastings, Elkton, Ponte Vedra Beach and off County Road 210 and 208, according to Sheriff’s Office records. Most of them are small-scale, one pot labs, that are highly mobile and produce enough meth for personal use. The same is true statewide. Most labs fit in a Gatorade bottle, small enough so that someone could “start making meth in one county and drive through three counties before it’s done,” said David Gross, special agent supervisor with the Florida Department of Law Enforcement, which monitors trends in drug use. The increase in meth lab discoveries is also happening across the state, but meth is already a nationwide problem, Gross said. Meth has been in Florida since the late 80s or early 90s, but use and production started to pick up in 2008. In 2008, law enforcement agencies across the state reported 180 meth labs, Gross said. That number rose steadily. In 2011, 676 meth labs were found. There were probably more since multiple areas in the state did not file reports. Reporting is on a voluntary basis. In 2012, 930 meth labs were reported statewide. In May 2011, the St. Johns County Sheriff’s Office Clandestine Laboratory Enforcement Team formed to better respond to the growing problem. The team is made up of deputies trained in handling meth labs. Hartsell supervises one of those teams. 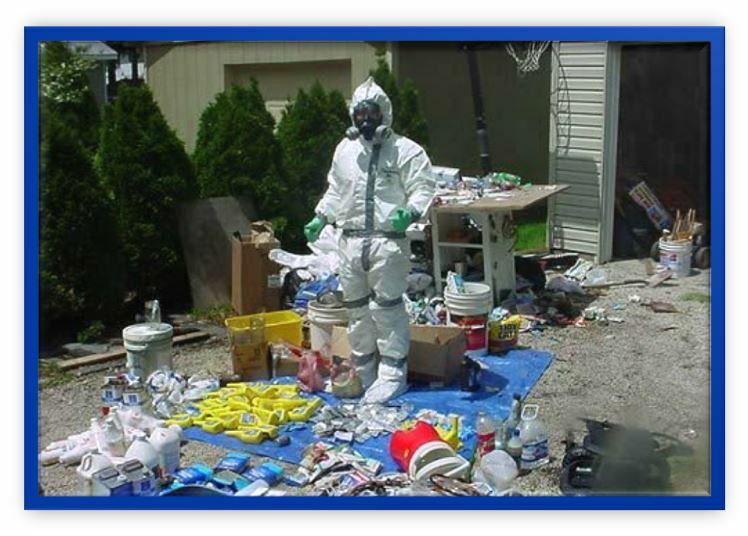 When the Sheriff’s Office meth team arrives at a scene, officials suit up and remove the lab from the home. That takes four to six hours and costs from $500 to $2,000 depending on the size of the lab, Hartsell said. Meth cooks endanger not only the people cooking them, but surrounding communities. The gases used in the cook are toxic and highly flammable and explosive. In 2010, a Sheriff’s deputy had to be taken to the hospital for an inhalation injury after breathing in the toxic fumes during an investigation, Hartsell said. Meth use also increases criminal activity, affects surrounding communities and costs the county money. As with other drugs, people often steal to support their habit, Hartsell said. Meth labs are toxic to people and homes. Cooking meth or smoking it creates gases that seep into walls, carpets and furniture, he said. If a building is not cleaned properly, the residual gases are still there, and it’s a health risk. Depending on the extent of meth use, decontaminating a building could mean ripping out walls and throwing away furniture, costing thousands to tens of thousands of dollars. Sometimes houses are so badly contaminated that they need to be demolished. St. Johns County Code Enforcement officials recently demolished a mobile home at 1990 Powell Road because meth had been cooked in the home. Two labs had been found there over the past few years. The property owner opted to have the building torn down instead of paying for the clean-up. Officials said meth use will continue to be a problem in the state and the county despite efforts to fight its spread. Street names: Batu, Bikers Coffee, Black Beauties, Chalk, Chicken Feed, Crank, Crystal, Glass, Go-Fast, Hiropon, Ice, Meth, Methlies Quick, Poor Man’s Cocaine, Shabu, Shards, Speed, Stove Top, Tina, Trash, Tweak, Uppers, Ventana, Vidrio, Yaba and Yellow BamLooks. ■ How it’s done: Meth can be swallowed, snorted, injected or smoked. ■ Affects: Meth creates an intense rush with highs that can last for half a day. The drug releases high levels of dompamine into the pleasure areas of the brain. Long-term abuse can cause addiction, violence, anxiety, confusion, insomnia, paranoia, hallucinations, delusions. Dopamine-producing brain cells and serotonin-containing nerve cells can be damaged by exposure to meth. ■ Overdose: Taking too much meth can cause a heart attack, stroke and multiple organ problems as the body temperature is raised to dangerous levels. Overdosing also can cause convulsions. ■ Legal: Meth is a Schedule II controlled substance and is prescribed, in very limited use, to treat obesity and attention deficit hyperactivity disorder. ■ Where it all started: Mexico produces most of the meth that is imported into cities in the US. Many meth labs found in the U.S. are small scale labs. ■ What’s been done: The Combat Methamphetamine Epidemic Act of 2005 requires businesses that sell non-prescription products that contain major ingredients in meth — pseudoephedrine, ephedrine or phenylpropanolamine — to make customers show ID and sign a logbook to purchase the products. They must also keep the products in a locked cabinet. ■ Florida has its own laws regarding the sale and purchase of ephedrine and its related compounds. The State Legislature passed a law in 2010 that controls the sale and purchase of the chemical, and created an electronic database for sellers and law enforcement to keep track of who is buying and selling, according to the Florida Department of Law Enforcement.